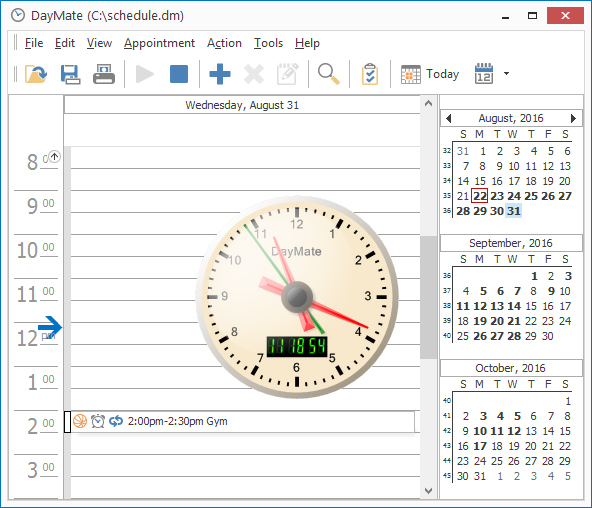 DayMate - A simple scheduler that enables you to plan your daily activities. 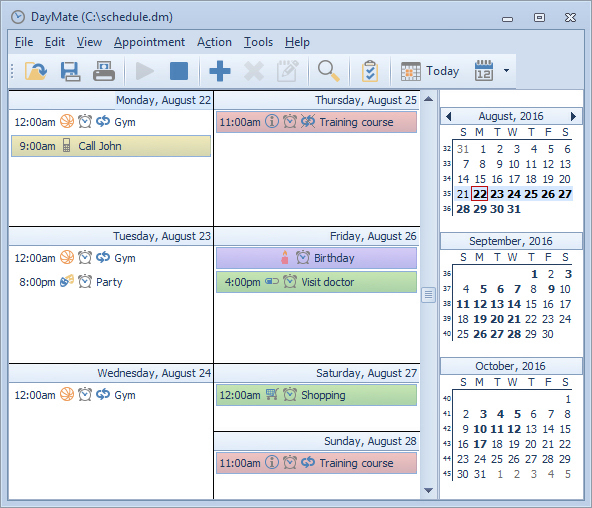 DayMate is a simple, easy to use scheduler that enables you to plan your daily activities, but also set system actions. Thus, you can schedule a system shutdown, a program's launch or a Skype call. The software prioritizes and adds audio reminders to any activity that you have planned for the future. 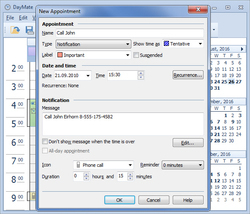 The scheduler configuration window offers several options for customization, such as type of activity, priority, time, date and mention of possible event recurrence. Additionally, you may add a message to be displayed when the event is due. Depending on the type of event, the software enables you to set which program to launch, whether it should shut down or reboot the computer. Alternatively, you may specify the email address you wish to check, URL you want to visit or the Skype account or phone number you wish to call. All reminders can be assigned with a priority label, from Important, Business or Needs Preparation, to Birthday, Vacation or Personal. 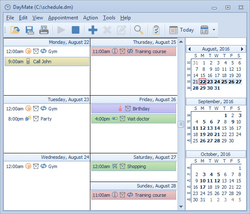 You can easily find an appointment, thanks to DayMate's integrated searching engine, list all the events that are planned, as well as view a week, month, year or Gantt diagram with all the engagements you have planned. After setting reminders, you can enable or disable the alarm for all of them, with one click. 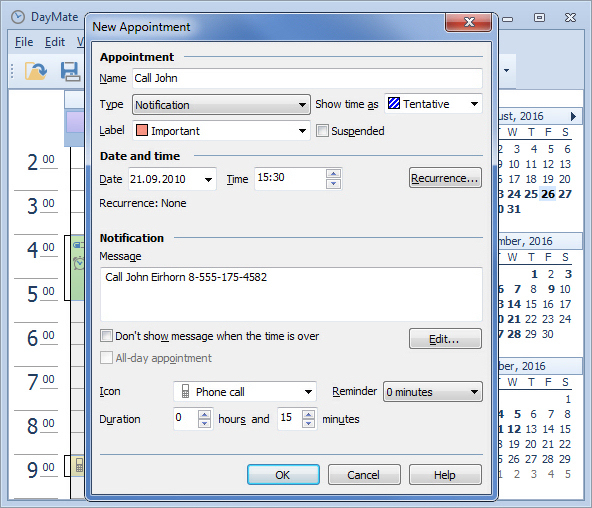 Importing or exporting schedules to Outlook is also facilitated by DayMate, especially when the planned event is sending an email or checking the mailbox. Alternatively, you may import data from iCalendar and export charts or tasks to PDF. DayMate is a versatile event planner, capable of setting reminders, synchronize time with a secure online source, display tasks marked on a calendar, as well as schedule computer shutdown or a program launch. The software offers Skype support and creating schedule backups in Outlook, iCalendar or PDF. 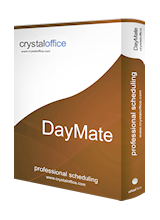 If you wish to protect your data and schedule, DayMate can only open with the right password. The program is available for $19.95 , but the winners of our contest will get it for free.